This is a Christmas gift that I made for one of my sets of Aunts and Uncles. It is the same pattern of a quilt that I made in the summer but this time it is done in Christmas fabrics. I’ve had this quilt shop jelly roll since before my daughter was born in 2008 and finally it is sewn into a quilt. We had an early Christmas dinner on Grey Cup Sunday at my Aunt and Uncle’s house and we did our gift exchange that day so they are now able to enjoy their quilt for the whole Christmas season. Whew! One gift off the list. I don’t know if anyone is checking this blog when I have not had time to post on it. With all the back-to-school and back to kids activites it has been insanely busy around here. My military husband left on Sept. 9th and I have not gotten any sewing done! I am just too busy running everything on my own. I did finish a Halloween quilt top before he left but have not been able to finish the quilt yet. Sadly, nothing has been done on my Farmer’s Wife quilt in over a month. 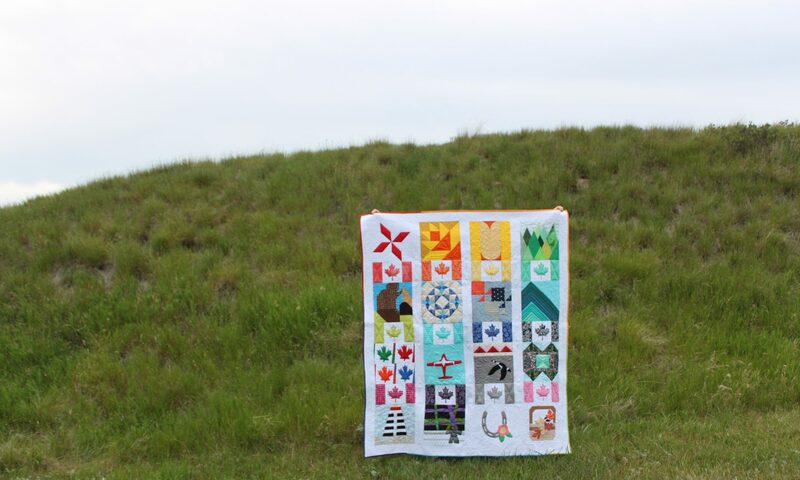 In happier news… I sold my first quilt from my Etsy shop. That was very exciting! My husband should be home at the end of the month so I hope I will have something to post on here soon. Last week I finally sewed a quilt for my best friend. We’ve been friends since 1993 so it was about time. In my defence… I’ve been a little busy with babies and toddlers the past few years. Anyway, here it is! It used one jelly roll and I love how it turned out. I used the “Strip-Smart Quilts” book by Kathy Brown and specialty ruler on this one. I got these blocks done last night. Just in time for Wednesday. 🙂 It’s good to have these little deadlines to keep us all on track. I have been sewing them in order but last night I skipped ahead to #29 because I needed to do an easy one. For some reason I was having trouble with this one. I had to rip out and re-do six seams. I was tempted to only do the one block but then I found an easy one to do next. Ahhh. No seam ripper used here. I will keep on “plowing” next week so I can “reap” the rewards of finished block. Block 22: Corn and Beans… except that my green fabric has peas on it. This block is 5 1/2 x 5 1/2 inches (mine are coming out that size finished instead of 6 inches… I think it was my printer when I printed the templates). IT HAS 40 PIECES! And I can say that it was painful but I’m glad I ripped the bandaid off and got it over with. I am proud of the finished block. Happy Farmer’s Wife-ing everyone!